Note: For CDR reporting, you must also enable the Syslog feature. 1. Open the "Advanced Parameters" page (Configuration tab > VoIP menu > SIP Definitions submenu > Advanced Parameters). a. In the "CDR Server IP Address" field, enter the IP address of the CDR server to where the device sends the CDR logs. None = CDRs are not used (default). End Call = CDR is sent to the Syslog server at the end of each call. Start & End Call = CDR report is sent to Syslog server at the start and end of each call. Connect & End Call = CDR report is sent to the Syslog server at connection and at the end of each call. Start & End & Connect Call = CDR report is sent to the Syslog server at the start, at connection, and at the end of each call. Note: If no IP address is defined, the CDR logs are sent to the Syslog server. Advanced PBX Data Logger should be configured to the TCP server mode and listen on 0.0.0.0:4000 (see below). 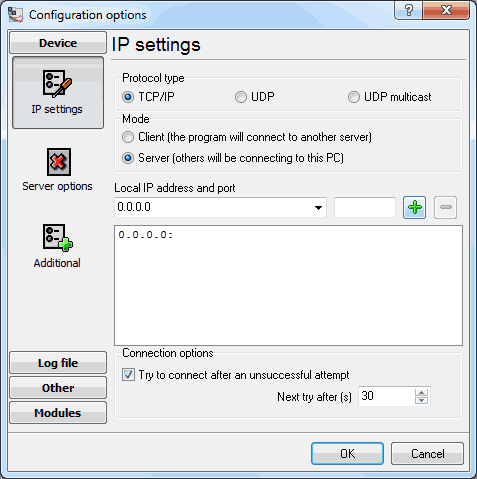 The port number should match the value from the SMDR settings in AudioCodes VoIP Gateway.